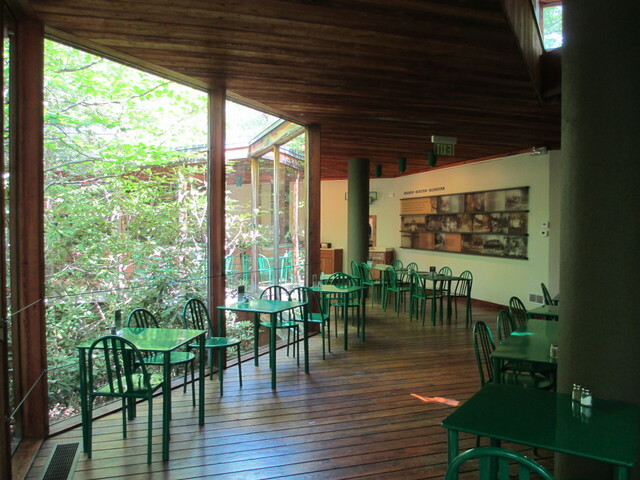 The visitors center, store, and cafe are up the hillside out of sight of the house and very attractively done in a style I think of as Modern Zoo. The day grew warm and humid, but the trees and canopies gave shade while permitting breezes through. The trees along the road were impressive and have obviously been there for a while — Lawrence and I were seeing many trees with 20′ straight and clear spans that made us drool to think of the lumber (responsibly harvested from mature trees starting to die, of course). 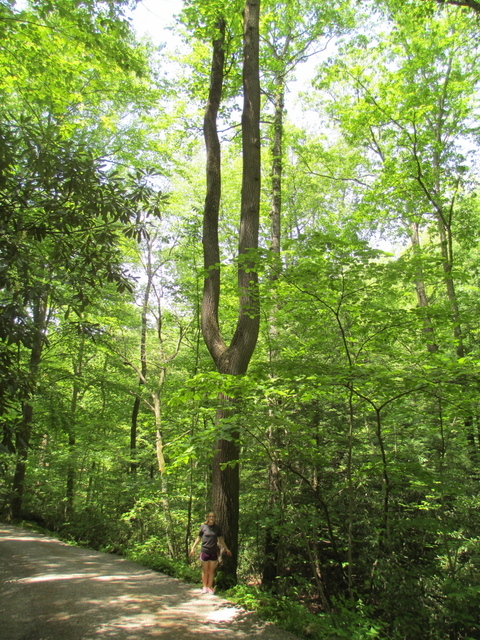 This tuning-fork-shaped tree caught my fancy; Lydia is for scale. The living room was about half the size (area, not linear dimensions) that I imagined. The few interior pictures I’ve been able to find published were doubtless taken with aggressively wide-angled lenses and not having paid enough attention to fisheye distortion to clue me into the lens used, I envisioned it larger than it actually is. It would serve very nicely for a family with a few friends over, but Kaufmans wanted to entertain larger groups and the room must have been very active when they did. Most of the rooms, in fact, are smaller than I expected. The stairs leading from the living room down to the stream were blocked off but visible from both the inside and the outside of the house. They looked beautiful and the landing was perfect for sitting and dangling feet. I expected the interior to have more quartersawn oak and geometric ornamentation, as I’ve seen in photographs of other Wright houses and in the Allen House. But those are Prairie Style and Fallingwater isn’t. Apart from the integration of boulders present on the site and the flagstone floor in the living room, the interior is surprisingly unsurprising. The bathrooms actually look high-end contemporary. And the exterior … Standing at the walking path’s viewing spot from which all the photographs you’ve ever seen are taken, Wright’s revolutionary design again amazes me. Using concrete as an aesthetic element, and in a residence, at that; designing with layered slabs, in Fallingwater to echo the rock of the streambed; cantilevering occupiable space and cantilevering over occupiable space. All of these are commonplace in leading-edge architecture of the 1970s. Designed in 1935. It took four decades for his architectural ideas to reach the public consciousness. Visionary.